About the creator: Tom Ewer is a professional blogger. His blog, Leaving Work Behind, helps people build successful cubicle-free careers, with an emphasis on freelance writing and blogging businesses. Who It’s For: Paid to Blog Jobs is mainly for beginner to intermediate-level freelance bloggers. More experienced bloggers might find many of the advertised rates lower than those they’re used to. What It Will Help You Do: Because the site features new jobs every day in a variety of niches, it’ll save you a lot of time looking for regular blogging gigs. I haven’t gone for more than three days without finding at least one client I wanted to pitch, and the variety in niches and topics is impressive. As I write this post, I can see one ad for New York Rangers fan bloggers, and another for gold investment writers. The site also features effective guides on how to pitch your services to potential clients and how to pitch guest posts to busy editors, saving you time, effort and anxiety if you haven’t created a template email yet. While I had been landing gigs on my own before, I’ve switched to Tom’s template and I find it quite effective. The Best Part: It makes it going through ads and applying for jobs so efficient that the process becomes fun. I wouldn’t be able to say the same for any other job board I’ve used, paid or free. What Would Make It Even Better: I’d love to see better-paying jobs, and a longer, more diverse list. While the board includes jobs in many niches, it would be great to see more opportunities to write about different topics. Occasionally, an ad will offer more than $100 for a post, but you need to read the ads carefully if you’re hoping to get a byline on a specific site. Some of the business owners are actually looking for you to place guest posts in other publications as opposed to writing for their own websites. A final, small opportunity for improvement: Sometimes it’s hard to track down an email address to apply to a job. If the ad’s from another job site and the ad doesn’t include the email address, you might have to register for the other job site to see the poster’s contact information. Eliminating this hassle would add to the convenience of PBJ, but it’s not a major sticking point. How It Changed My Life: In addition to making the process of looking for blogging jobs fun and easy, Paid to Blog Jobs has helped me connect with great clients. I’ve lined up recurring work with one client I found there, and another editor requested a follow-up submission after I sent in my pitch. So far, I haven’t had any problems with clients I’ve found through PBJ. I made a profit in my first month using the job board, so I would definitely recommend it to freelance writers who are looking for more blogging work. Our Recommendation: If you’re a freelance writer looking for new blogging clients, give PBJ a try. It can help you find gigs quickly, build experience in a new niche or improve your negotiation skills. While it might not be the best choice for more experienced bloggers, it certainly offers many opportunities for new and intermediate freelancers. Have you tried Paid to Blog Jobs? Tell us about your experience! Pinar Tarhan is a freelance writer and blogger for hire. Her specialities include freelancing, writing, traveling, relationships and entertainment, and she runs the blog Addicted to Writing where she helps fellow writers create and manage the career they dream of. I would like to see a review on the guide that he sells. Have you done that yet or would you possibly consider it. I am glad you did this for the product he offered because I always wondered about it as well. And I’m glad you found it helpful. Your great. This is exactly what I was looking for. I gave the site a try for a couple weeks. The pros: Updated daily with 10-15 new postings. When I did cancel my subscription, Tom/staff were very understanding. The cons: Most listings are from Craigslist, which aren’t typically great gigs. The rest are from ProBlogger, which you likely check already anyways. Most gigs paid $20-50/article, which is obviously too low for anyone other than a beginner writer. Thanks for sharing your feedback, Dale! I’ve been using this job board recently. The best thing is that you get close to 10 new jobs every day directed to your email. The worst is that most jobs listed are from craiglist, with the rates being rather subdued. I think the Den is a much better place to be in. I think the Den is great. Den’s job board will suit you better if you are more into copywriting, or blogging for corporate clients. That said, the forums and products you have access to are incredible. With Tom Ewer’s board, you are more likely to find blogging gigs where you don’t have to do much reporting, so again, it’s about what kind of writing gigs you’re looking for. Great review. Thanks for introducing Paid to Blog to us. The options and payment seem fair. So glad you’ve found it useful. :) Please let us know your experience if you try it out. Thank you for writing this review. I was thinking about joining. I have been trying to find some good places to look for jobs. 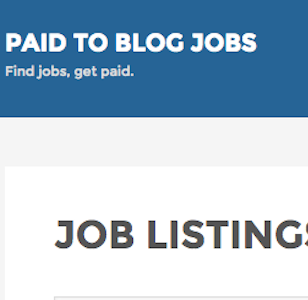 I realize this was posted a long time ago, but I would definitely NOT recommend Paid to Blog Jobs now. I signed up a month ago hoping to find a few new clients, but there were no job listings. There were only guest post listings, and they were all at least three years old. There is supposed to be a money back guarantee, but I’ve been e-mailing support for the last month, and they won’t so much as respond. I guess I’ve been scammed out of forty bucks.